The Senator representing Kaduna Central Senatorial District, Shehu Sani, has taken a swipe at governors threatening to retrench workers to be able to pay N30,000 minimum wage. 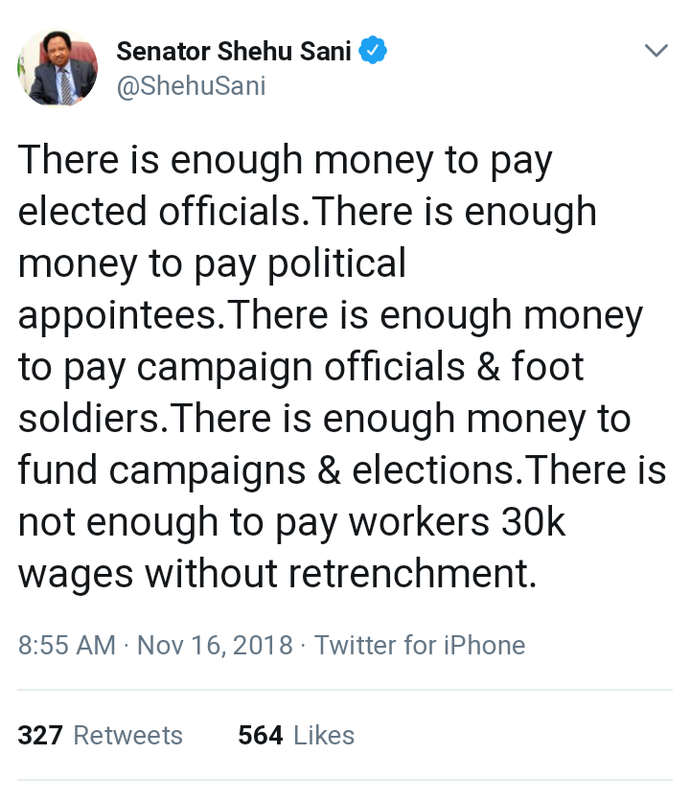 The Senator tweeted that the governors have enough money to pay political appointees, campaign officials and foot soldiers, but cannot be able to pay workers N30,000 minimum wage as demanded by the organised labor union. Chairman of the Nigerian Governors’ Forum and Governor of Zamfara State, Alhaji Abdulaziz Yari, had on Wednesday told newsmen at the end of an emergency meeting of the governors in Abuja that payment of N30, 000 wage was impracticable. Yari, however, said the proposed wage would be paid if labour would agree to downsizing of the workforce across the country. His words: "There is enough money to pay elected officials. There is enough money to pay political appointees. There is enough money to pay campaign officials & foot soldiers. There is enough money to fund campaigns & elections. There is not enough to pay workers 30k wages without retrenchment.